Riverside, New Jersey, U.S.A.: Simon & Schuster. Very Good+/Very Good+. 1993. Hard Cover. 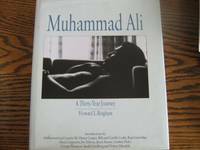 0671760785 Signed by Author Inscribed by Bingham and SIGNED by Muhammad Ali at the title page in purple marker. Ali has also signed 4 of the photograph pages with the same purple marker. Light bump at top of rear board. Else very clean. .
Simon & Schuster, 1993-10-07. Hardcover. Very Good. Signed by Author. Author and Ali signed (title page and dated 10-5-93) first edition first printing clean tight and bright. Price intact jacket shows faint tone. No chips or tears. Please email for photos. Simon & Schuster. Hardcover. 0671760785 Book and dust jacket have minor wear. SIGNED and inscribed by Muhamma Alit, "To Gary, Muhammad Ali." A nice copy. ***PROMPT, PROFESSIONAL SERVICE!*** . Very Good. 1993. 1993-09-05. New. Ships with Tracking Number! INTERNATIONAL WORLDWIDE Shipping available. Buy with confidence, excellent customer service! Riverside, New Jersey, U.S.A.: Simon & Schuster, 1993 Light rub to brightly gilted spine extremeties. Spine is slightly cocked. Small pencilled price and initials on front end paper. A remainder mark on page bottoms. Otherwise clean tight and bright. Price-clipped dust jacket in new folded only Brodart with edge wear, some edge tanning and soil. Introductions by Muhammad and Lonnie Ali, Bill and Camille Cosby, Jim Murray, Gordon Parks, George Plimpton, Alvin F Pouuissaint, M.D., Budd Schulberg, Ralph Wiley, and A.S. "Doc" Young.. First Edition. Hard Cover. Very Good +/Very Good. 4to - over 9¾" - 12" tall. Muhammad Ali: A Thirty-Year Journey. Inscribed to NY paparazzi Bill Vetell. Muhammad Ali: A Thirty-Year Journey. Photographs by Howard L. Bingham. Signed and inscribed at title page by author to famous NYC paparazzi Bill Vetell (1940 -1983). Simon and Schuster, 1993. Hardcover. 1st Edition. More than one hundred photographs of the Greatest: Muhammad Ali and his boxing career. Bound in dark blue cloth with gilt title to the spine and in a pictorial dust wrapper. Thirteen introductions, including Nelson Mandela, Budd Schulberg, Bill Cosby and Muhammad Ali himself adding context to photos, and with many amusing stories. The photos taken by Howard Bingham, a friend of Muhammad Ali who had been with him since the beginning of his boxing career. Robson Books Ltd., 1993. Hardcover. Good/Good. 1993. First UK Edition. Unpaginated. Signed by the author. Signed by both Bingham & Ali. Pictorial dust jacket over blue cloth with gilt lettering. Contains photographic plates. Bright clean pages with light tanning to endpapers and page edges. Former owner's name and dedication on front paste-down in ink, with pencil marginalia to endpaper. Grey rubbing and a couple of tiny nicks to text block edges. Occasional finger marking throughout. Slight tanning along spine and board edges. Mild rub wear to surfaces and edges with crushing to spine ends and minor bumps to corners. Boards are noticeably bowed. Dust jacket has a few small creases, slight tanning, rubbing and shelf wear. Flaps are unclipped. Scuffed label and beige water drop on front panel. Little More, Japan, 1997. Soft Cover. Very Good/Very Good. Photographic anthology by Howard L. Bingham. Text in Japanese. The last picture is then one taken at the Olympics in 1996 where Ali is holding the flame 115 pages. Illustrated with black and white photographs. Quantity Available: 1. Shipped Weight: Under 1 kilogram. Category: Sport::Boxing; Sport::Boxing; Rare & Collectible; Sports & Pastimes; Rare & Collectible. Inventory No: 104396..
1998-02-07. Good. Ships with Tracking Number! INTERNATIONAL WORLDWIDE Shipping available. May not contain Access Codes or Supplements. May be ex-library. Shipping & Handling by region. Buy with confidence, excellent customer service! Simon & Schuster, 1993-10-07. Hardcover. Used:Good. Simon & Schuster, 1993-10-07. Hardcover. Like New. As new clean tight and bright first edition first printing. Please email for photos. Robson Books Ltd, 1993. Book. Near Fine. Hardcover. 1st Edition. Near fine book and jacket..
NY: Simon and Schuster, 1993. - photographic portrait of Ali, family, friends, boxers, Malcolm X, etc - great photographs - faint remainder dot bottom edge, else fine in fine price clipped dj.. First Edition. Cloth. Fine/Fine. Illus. by Bingham Photos. 4to - over 9¾" - 12" tall. Simon & Schuster, 1993-10-07. Hardcover. Good. Simon & Schuster, 1993. Hardcover. Good. Disclaimer:A copy that has been read, but remains in clean condition. All pages are intact, and the cover is intact. The spine may show signs of wear. Pages can include limited notes and highlighting, and the copy can include previous owner inscriptions. The dust jacket is missing. At ThriftBooks, our motto is: Read More, Spend Less. Simon & Schuster, 1993. Hardcover. Good. Disclaimer:A copy that has been read, but remains in clean condition. All pages are intact, and the cover is intact. The spine may show signs of wear. Pages can include limited notes and highlighting, and the copy can include previous owner inscriptions. At ThriftBooks, our motto is: Read More, Spend Less.Dust jacket quality is not guaranteed. Simon & Schuster, 1993. Hardcover. Acceptable. Disclaimer:A readable copy. All pages are intact, and the cover is intact. Pages can include considerable notes-in pen or highlighter-but the notes cannot obscure the text. At ThriftBooks, our motto is: Read More, Spend Less.Dust jacket quality is not guaranteed. Simon & Schuster, 1993. Hardcover. Acceptable. Disclaimer:A readable copy. All pages are intact, and the cover is intact. Pages can include considerable notes-in pen or highlighter-but the notes cannot obscure the text. The dust jacket is missing. At ThriftBooks, our motto is: Read More, Spend Less.